Let’s start off with the most basic type of stop: the percentage-based stop loss. The percentage-based stop uses a predetermined portion of the trader’s account. For example, “2% of the account” is what a trader is willing to risk on a trade. The percentage risk can vary from trader to trader. More aggressive ones risk up to 10% of their account while less aggressive ones usually have less than 1% risk per trade. Once the percentage risk is determined, the forex trader uses his position size to compute how far he should set his stop away from his entry. A trader is putting a stop, which is in accordance with his trading plan. This is good trading right? You should always set your stop according to the market environment or your system rules, NOT how much you want to lose. We agree that this sounds confusing, but let us explain with an example. You remember Newbie Ned from your Position Sizing lesson, don’t you? Newbie Ned has a mini account with $500 and the minimum size he can trade is 10k units. Newbie Ned decides to trade GBP/USD, as he sees that resistance at 1.5620 has been holding. As per his risk management rules, Ned will risk no more than 2% of his account per trade. At 10k units of GBP/USD, each pip is worth $1 and 2% of his account is $10. 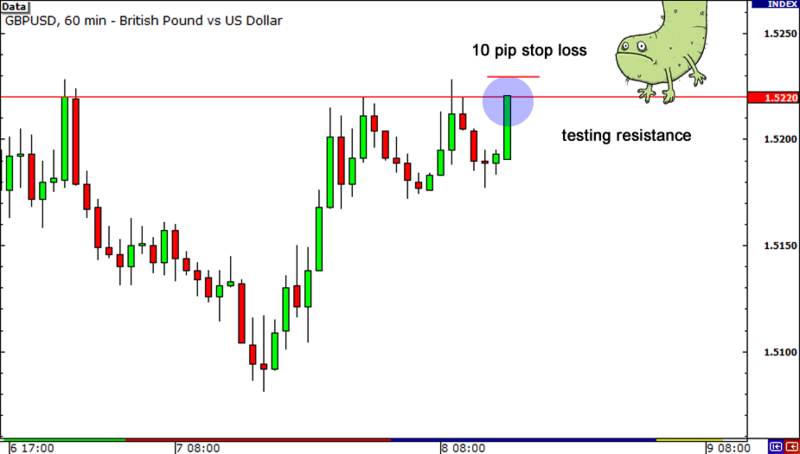 The largest stop Ned can put on is 10 pips, which is what he does on this trade by putting his stop at 1.5630. But GBP/USD moves over 100 pips a day! He could easily get stopped out at the smallest move of GBP/USD. Because of the position limits his account is set to, he is basing his stop solely on how much he wants to lose instead of the given market conditions of GBP/USD. And bam! Ned got stopped out right at the top, because his stop loss was too tight! 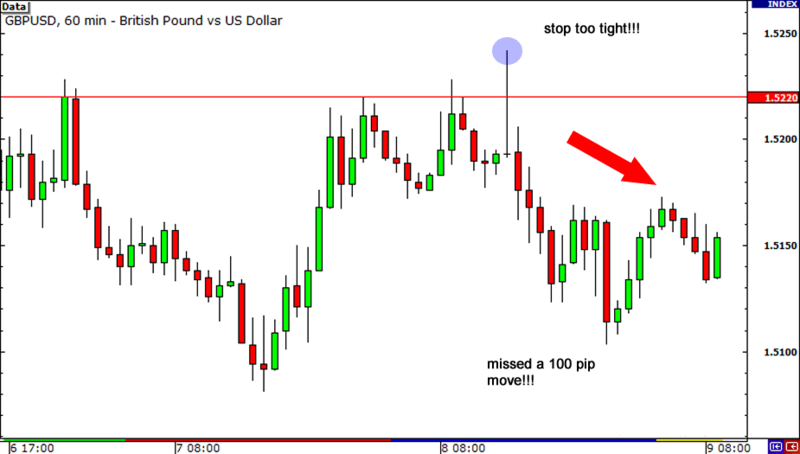 And aside from losing this trade, he missed out on a chance to grab over 100 pips! From that example, you can see that the danger with using percentage stops is that it forces the forex trader to set his stop at an arbitrary price level. Either that stop will be located too close to entry, like in Newbie Ned’s case, or at a price level that doesn’t take technical analysis into account. For all you know, you could be setting your stop right at that level where the price could turn and head your way (who hasn’t seen that before?). But because you already got stopped out, you wouldn’t be able to bag those pips! Darn it! The solution for Ned is to find a broker that suits his trading style and starting capital. In this case, Ned should trade with a forex broker that allows him to trade micro or even custom lots. At 1k of GBP/USD, each pip is worth $0.10. In order for Ned to stay within his risk comfort level, he could set a stop on GBP/USD to 100 pips before losing 2% of his account. The math: 100 pips x $0.10 = $10. He now has the ability to set his stop to the market environment, trading system, support & resistance, etc.